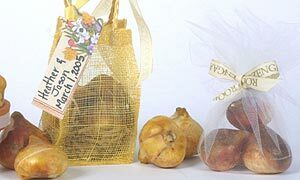 For something different, consider using Tulip Bulbs as your WEDDING favors! 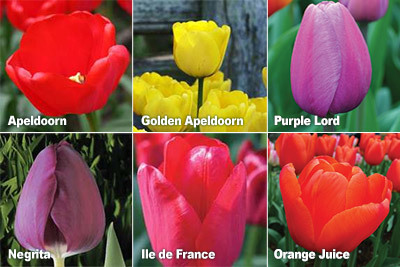 If your wedding falls between July and mid-September, we will have a nice assortment of bulbs available. They are all packages of 50 bulbs, one variety per package, for $34.75 plus shipping & handling. The only items available beginning July are the varieties below. Orders must be placed by calling us toll free at 1-866-488-5477. We ship the bulbs to you then you package them according to your own personal taste. Most brides use one or two bulbs per "favor" and place them in either tulle wraps or decorative boxes. The packaging must allow the bulbs to breathe. They're becoming quite popular, although certainly not common, as wedding favors! If you have any questions or would like to place an order, please call us toll free at 1-866-488-5477! Due to the special handling requirements, Bulbs for Brides orders do not qualify for our bonus bulb item.